President Trump was in Michigan Wednesday, and he brought automakers a gift. In a move that will likely cripple part of President Obama’s attempt to fight climate change, Trump announced a review of regulations requiring new cars and trucks to have an average fuel economy of 54.5 miles per gallon by 2025. Adopted by the Obama administration in 2012, the fuel-economy targets were set for review in 2018. But seven days before Obama left office, in an apparent bid to lock the standards in place, then–EPA administrator Gina McCarthy finalized the rules, which environmentalists have praised because they would cut carbon emissions, reduce oil consumption, and promote technological innovation. Trump plans to revive the 2018 review and have his EPA and Transportation Department study the rules over the next year. In April 2018, the Trump administration will propose its new fuel economy standards, according to the Times. While the White House hasn’t explicitly said that the Corporate Average Fuel Economy (CAFE) targets are going to be gutted, the writing’s on the wall. 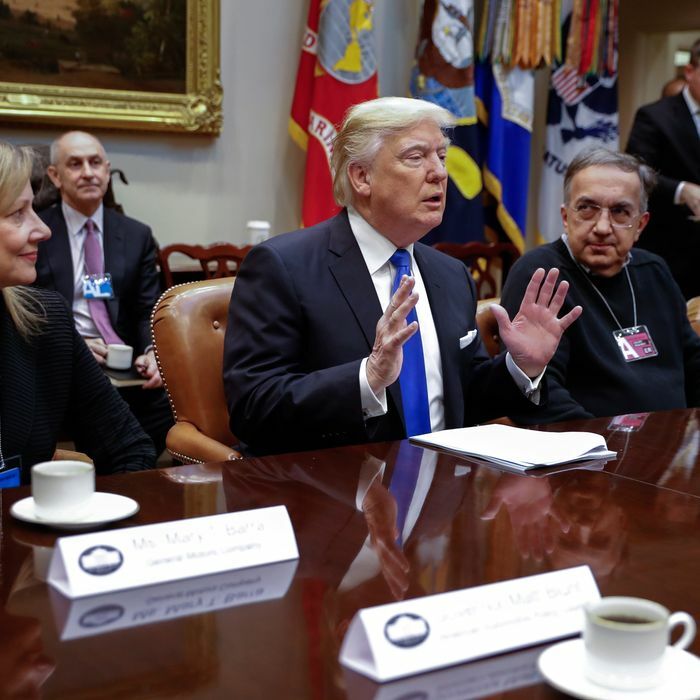 Sean Spicer said Trump’s trip to Michigan will involve discussion with auto executives on “rolling back federal red tape” and as those executives have made it known, the CAFE standards strike fear into their hearts.